This is one of those posts where I don't have any idea how to start......it's Punjabi Chole(chickpeas) or more popularly known as Chana Masala. I prefer to call them chite(white) chole(chickpeas), that's how every Punjabi call it. No matter whatever you call it they are almost on every Indian restaurant's menu and everybody loves it from kids to adult, even the picky eaters won't say anything if chole are on the menu. I was avoiding this post from long time for two reasons 1) it's kind of a regular food in our house so I don't see any need for me to record this recipe 2) chole brings back so many memories from the childhood, so I knew that it's gonna be one long, time consuming post for me(authentic & famous food can be little difficult to write....don't U think so). But a friend from neighborhood after browsing my blog mentioned that I don't have many authentic Punjabi recipes on my blog & she also wanted recipe for Punjabi chole. Please scroll down if U want to jump to the recipe because I really can't write this post without sharing few of my memories. If you ever lived in Delhi(India's Capital) even for couple of days, then you must know how important this dish is.....it's one of the famous breakfast item in most of the restaurants, goes well with puri / bhaturas / kulchas(my fav. ), available in every nook & corner of the city, some very famous others not so much but still selling a lot of this stuff. Chole-chawal(rice) is also one good combination, if you have never tried that combination give it a try, I still remember once a week in our school canteen(that's what our cafeteria's were called) chole-chawal use to be in the menu, though chole has been regular in my mom's house also and she cooks really tasty food, but still I loved to eat those chole chawal served in Dona's(eco-friendly Indian disposable bowls made using dry leaves), I miss that how we all friends use to book(pre-order) our chole-chawal before the recess starts with canteen wale uncle-ji, it was quite high demand item & no matter what, we could never think of missing it. Here comes another story, every thursday evening, trip to the weekly market.....moms looking for fresh vegetables & fruits, we kids waiting to reach that section of the market where U could smell chole from 2 blocks away, as you approach near, you see groups of people standing in line waiting for their "to go" packs of chole-bhatura & on the other side 2 tables jam-packed, no chairs everybody standing & enjoying their share of chole-bhatura, chole topped with lots of imli(tamarind) chutney & spicy onion salad. That was our fast food way better than today's fast food joints. Fresh food(no frozen stuff)....prepared in front of your eyes, no worries of hygine, we ate it almost everyday never got sick.......I miss all that stuff. Just to give you an idea how much I love and miss the convenience of getting a plate(or may be two for me) of chole-bhatura after moving out of Delhi.............it's been a decade since I started living in America even after those many years & the convenience of freezers(where I can store food for my weekend morning cravings) still on lazy weekend mornings when I don't want to get up..... my favorite dialogue( I should better call it a complaint) is......we even don't have any single decent chole-bhatura take out nearby. 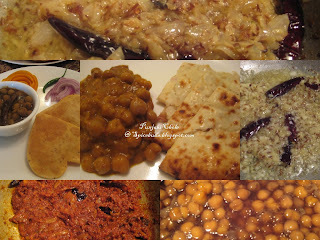 I only shared few of my memories and I'm getting this craving for chole-bhatura's now, before I start writing the recipe thanks to you guys who took time out to read this, now to the recipe and I'm starting it with notes as I feel these are the few important things u need to know before moving on to the recipe. Notes : 1) if you are planning to use dry chickpeas U need to soak them for atleast 8 hrs. or so, I usually soak them overnight for next morning brunch. 2) another important thing is getting the dark blackish /brown color of this dish. One popular way is use black tea leaves.....tie them in a cotton cloth & make a pouch, boil them with chickpeas & after boiling fish the pouch out. 3) another option for getting dark color is using 3-4 dry amla(Indian gooseberry) pieces while boiling the chickpeas, learned this from my SIL few years back, works well it also gives little tangy flavour. But if u don't have access to dry amla, stick with tea leaves or next option. 4) Brown your masala to the stage where it's totally brown BUT NOT BURNT, could be little tricky, also if using less oil....kind of difficult to achieve this stage. 5) I don't use any chana masala(my family & friends love it the way I make, never complains of anything missing in it), actually I don't think there is anything called chana masala in any Punjabi household or for that matter all the ready made masalas are just for our convenience....before the birth of these ready to use masala powders there use to be these various spices only which our moms use to mix up in various proportions according to the dish they are going in. Dhania(coriander) powder is one important spice in punjabi chole alongwith home made punjabi style garam masala, which basically has all the ingredients which U would find in any store bought masala powder. 6) This dish usually has some kind of sourness added to it. As I mentioned above I boil them with amla pieces, more traditional option is anardana(dry pomegrante seeds) or other common options are dry mango powder(amchur), tamarind(Imli) juice or juice of lime/lemon. Boil soaked chickpeas(check notes above) with salt & bay leaves, it can take anywhere from 15-20 minutes in pressure cooker or use canned one. While chickpeas are boiling you can start working on the masala(tarka) part of it. Heat oil in a wide heavy bottom pan. Add Cumin, dry whole red chillies, stir after around 30 seconds or so add garlic and saute it...... next add ginger & also sprinkle a pinch of salt on it. Salt will help release water from the ginger which helps ginger not to stick to the pan. Once ginger garlic is sauteed add onions & cook them on med. gas till they are brown...careful not to burn these. It might take 10-12 minutes. Now add all the spices listed under dry spices category. If you are using little less oil at this stage spices might get burn so to avoid that add a splash of water along with them & it will be fine. If using amchur/anardana add at this time. Let spices get mixed up with onion mixture then add a spoonful of tomato paste. After a minute or so add tomatoes & chopped green chillies. Let the whole tarka cook for 10 minute or so. Aroma will tell you it's done or when all the water from tomatoes is cooked up, oil start leaving the sides & tarka is turned into paste like texture, it' s done. Now add boiled chickpeas to the masala mixture, reserve the water. If using tamarind add it at this time. Only add as much water as much u need for the gravy, if any left can be used in making dough for roti. Let the whole dish simmer on med. heat for at least 10-15 min. or till u get the desired thickness of the gravy. Before serving add splash of lime/lemon juice as per your taste. Garnish with some freshly chopped cilantro. Serve it along with your favorite of puri/bhatura/kulcha/roti with the side of some onion salad & I promise you will prefer to skip the dessert part of the meal & instead eat an extra serving of chole/chana masala. Finally, my post is done.....before hitting the "Publish Post" I want to share an experience with u guys which happened 2 days back......when this post was still a WIP(work in progress).....half of it was done that is upto the ingredient part & from the procedure/method part, I had only written boil the chickpeas and no pics & my little one came & started playing with the computer mouse......so I decided to take a break but before I took her away from the computer she clicked few times & out of all the clicks she did.......one click was right on the target(though little too early), she clicked on "Publish Post" button. After an hour or so when I came back to write rest of the post then only I realised that my post is not only already published but has got 3 comments also. All of the comments were positive & nice but I believe my fellow bloggers were trying to be nice as no one mentioned that recipe part is missing.....may be they got confused or they were in hurry or may be if you already know some recipe for a dish you don't need to see the whole recipe, u just glance the ingredient list & u r good to go.....but I really think to get a comment like nice recipe one need to have some recipe first which my post was missing at that time, so sorry, but I had to delete those comments......Thanks to all of you who spared so much time for my not-so interesting story. thanks for the so informative post. I guess we all have our favourite little dhaba/restaurant from our city where we lived!!! As for me, I have the luxury of seeing this getting done one more time in person soon I am guessing!!! Thanks a ton! Always loved to have chhole with raw onions and a little lemon...YUM! You are true dear people in Delhi are crazy about Chole-chawal, puri-chole, tikki-chole...You know after coming here in Banglaore I'm yet to find a shop where I can get the authentic taste of Chole bhature. I love this combination like anything!! I am very much fond of chhole. You have prepared it very nicely. Chhole looks delicious, fabulous and tempting. 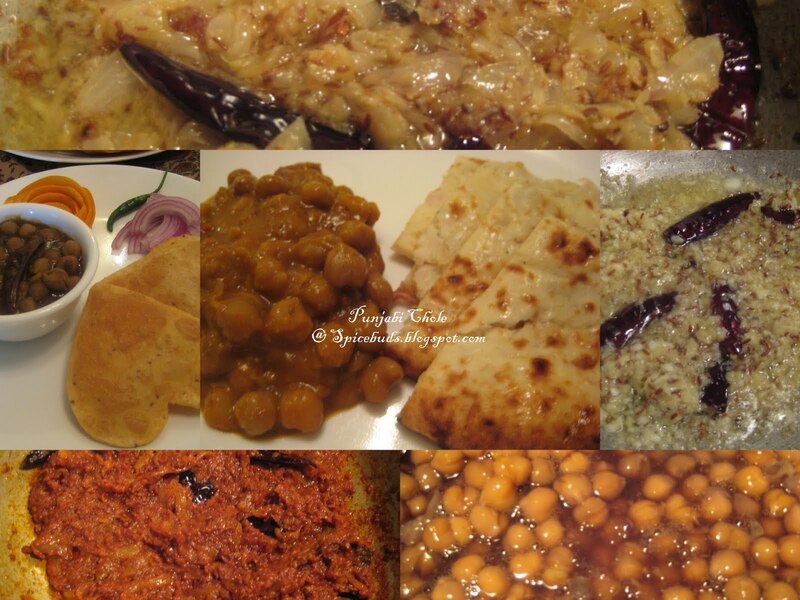 Chana masala is sch a polpular one and this looks awesome..I am bookmariking your masala recipe :-) Thanks.. I love Chole and it's a staple at my home. Need to have it once a fortnight. Love the fact that u have share recipe for masala too. chitte chhole is what we used to call it when we were kids , now it's just chhole n the kaale chhole is pronounced so. i love chhole chawal n chhole in just any form . I make it in a slightly different way n have posted a very shortcut recipe with amchoor for sourness , i prefer using a cast iron kadai for it n cook the chhole in that kadai for almost half an hour ...it becomes quite dark without any additives. one of our faves. but still buy my chana masala. Thanks for the recipe!! Thanks for this informative post! Love chick peas and this is giving me other ideas on how to fix them! hey...how have you been..thanks for stopping by at the blog..its been a little slow at my end...I need to be disciplined about posting I guess. Howz your little one doing ! Let me know if you plan to come down to DC!! hey was looking for punjabi garam masala (home made) recipe..luv authentic vegetarian punjabi stuff!! Wow, Its looking very tasty , landing page design . I love it.